Rev-A-Shelf's polymer half moon organizers are revered as the best on the market. Whether you are replacing an old unit or just wanting to access your base corner cabinets. 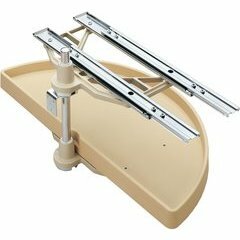 You will not be disappointed with the high quality design and the durable mounting hardware with ball-bearing slides. 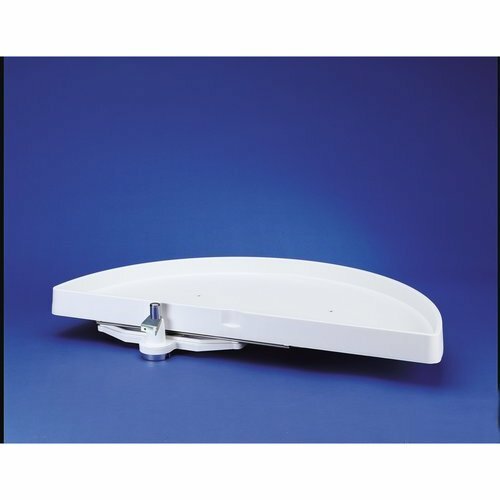 Image Disclaimer : Image shown is of 33" model. Actual unit is 31". The instructions were simple and straightforward and I was done in less than 1 hour! One tip: Before you put the upper support structure on the chrome shaft, you have to install the lower shelf. Tho photo shows BOTH installed in the guide but how do you slide the bottom shelf over the chrome shaft to the bottom position if the upper bracket is installed? You guys are funny! Fortunately, I caught it before and the rest went smoothly!Thanks! Great-Love it. 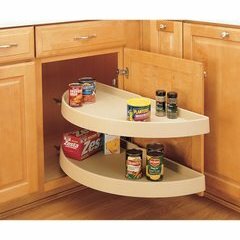 Save me from cutting out cabinet to install a lazy susan. The directions were written in red for right-sided opening & black for left- sided opening & they were superimposed over each other. Very confusing. It took two of us & several tries to figure out how to correctly install the blind corner unit. It would have been better to have separate directions.